Chung Sang-Hwa was born in Yeongdeok, Gyeongsangbuk-do, Korea in 1932. Graduating from the oil painting department of the Seoul National University in 1956, Chung first worked in the then-prevalent style of Korean informel. In 1967, he moved to Paris, at that time considered by the Korean artistic community as the center of the international art world. In 1969, he moved to Kobe, Japan, where his distinctive process of the repeated application and removal of paint from the canvas was conceived and refined. In 1977, he returned to Paris and finally settled in Seoul in 1992. There, he established his studio in Gyeonggi Province, where he continues to live and work today. Chung's work has been extensively exhibited in Korea and internationally since the late 1960s. Exhibition venues include the Poznań Biennale, Poznań; the Metropolitan Museum of International Art, Osaka; and the National Museum of Modern and Contemporary Art, Seoul. His works can be found in the permanent collections of the The Art Institute of Chicago, IL; Hirshhorn Museum and Sculpture Garden, Washington, DC; the Guggenheim Museum; the and the Musée d’Art Modern de Saint-Etienne, France; Samsung Leeum Museum of Art, Seoul; the Seoul Museum of Art, Seoul; the National Museum of Modern Art, Tokyo; the Shizuoka Prefectural Museum of Art, Yada Shizuoka City; and the Fukuoka Asian Art Museum, Fukuoka. 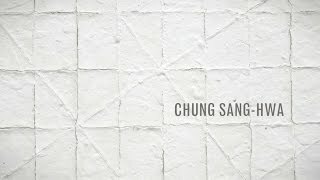 Notable exhibitions of Chung’s work in recent years include the solo exhibition Painting Archeology at the Musée d’Art Moderne et Contemporain, Saint-Etienne Métropole, France in 2011; From All Sides: Tansaekhwa on Abstraction at Blum & Poe Gallery, Los Angeles in 2014; and Dansaekhwa at the Palazzo Contarini-Polignac, Venice, Italy in 2015. Dominique Lévy Gallery presents an exhibition of Korean artist Chung Sang-Hwa (b. 1932). Presented jointly with Greene Naftali Gallery, New York, this represents the first solo exhibition of Chung’s work in the United States. The exhibition spans the artist’s career, with a survey of Chung’s work on view at Dominique Lévy and recent paintings displayed at Greene Naftali.